The City of Los Angeles has settled a year-long lawsuit alleging that Los Angeles City Councilman Jose Huizar (D) had sexually harassed his deputy chief of staff. However, details surrounding the deal remain shrouded in secrecy. “The parties have reached a global settlement. The lawsuit has been dismissed against all parties and they are now moving forward and will not discuss the matter any further,” according to a statement from Robert Alaniz, a spokesman for Huizar’s attorney at Walsh & Associates, notes local CBS affiliate in Los Angeles. Francine Godoy had claimed in her lawsuit that Huizar threatened her with retaliation when she refused to provide him with “sexual favors” when he offered to support her in an election campaign. Huizar has denied the charges against him, but reportedly admitted that the extramarital affair did take place while Godoy was working as his aide. He cited the relations as being mutually consensual. Huizar is married and has two children. Los Angeles City Attorney Mike Feuer reportedly said that the city did not pay any money to settle the Huizar case. However, it was revealed that earlier this year the city had agreed to pay $200,000 in legal fees to help Huizar fight the case, reports CBS. Huizar is facing a particularly challenging upcoming reelection bid. “This is going to be a very, very difficult race for him, and the ongoing legal conflict would have made it a lot tougher… he faced a lot of political and legal pressure to put this behind him,” political science Professor Jack Pitney said to CBS. 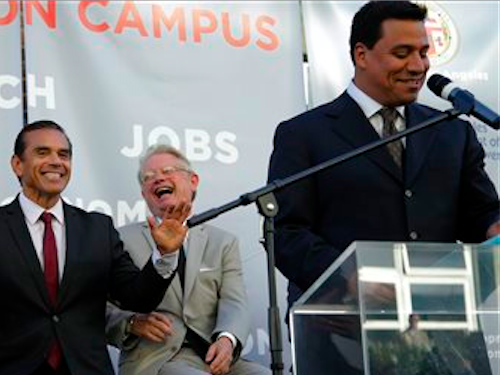 Huizar is the first Mexican immigrant to be elected to City Council in Los Angeles’ history. He faces L.A. County Supervisor Gloria Molina in November.